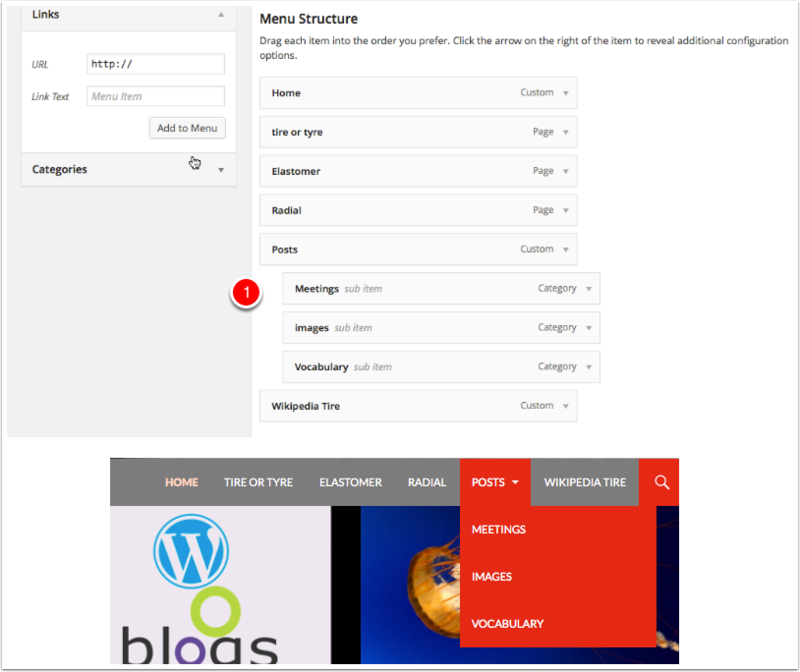 Menus can be used to organise the navigation of your blog. 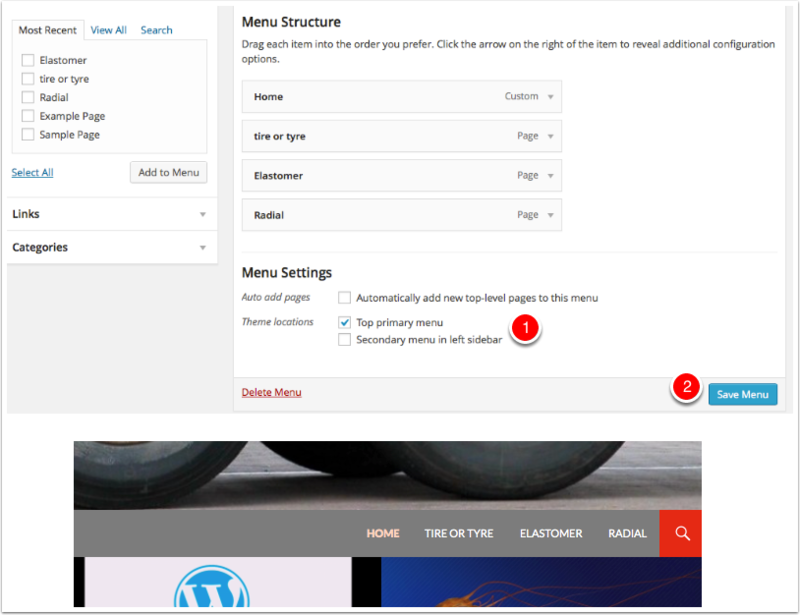 Some themes have their own menu system but we now recommend using the build in WordPress menu system as it is a lot simpler to use. Different themes have a varying degree of support for menus. more recent thems have better support. 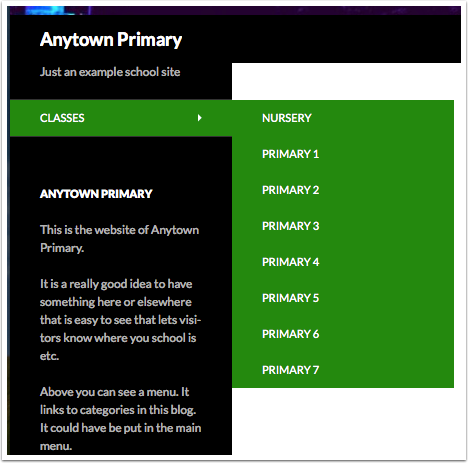 All blogs support presenting menus via a widget, but more modern themes allow menus in different locations. There are two stages to using menus: 1. creating the Menus and 2. Showing them on a site. 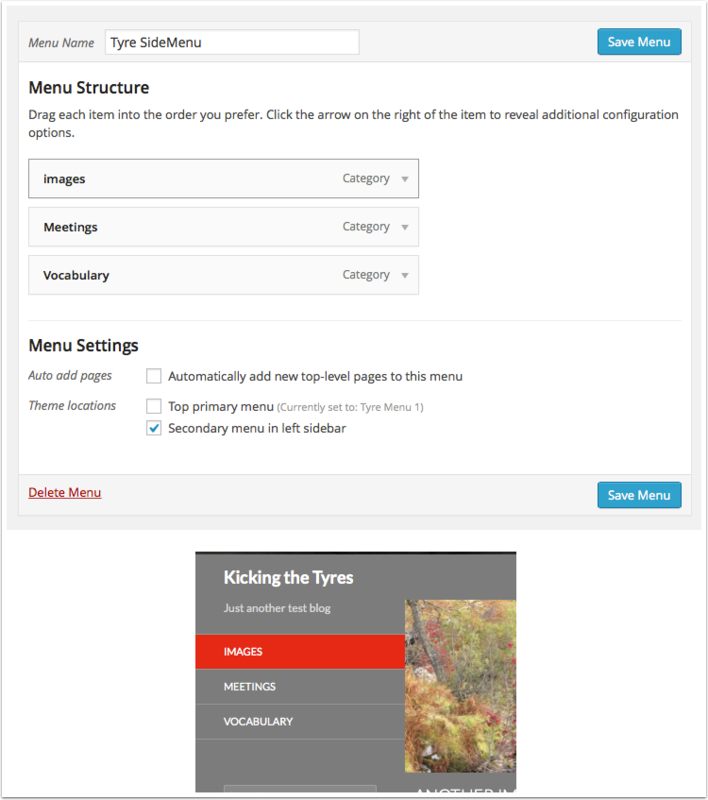 Some themes will automatically create a menu as you add pages. This menu can be replace after you make a menu. It is not listed in the site menus. In the screenshot below the site is using the TwentyFourteen theme. The menu  that appears across the site is created automatically. To acces the menus, after logging on, hover the mouse over the site name  in the admin bar and then choose Menus  from the drop down that appears. On the Menu screen, as we have not created a menu on this site before we need to create one. To add items to menus you select the items from the sections on the left  (Pages, Links or Categories) and them to the menu  and then organise them. After adding items you can reorder them by Drag and Drop, and make them submenus by dragging them to the right. Nere we have added some category menus (Meetings, images and Vocabulary). We have made them submenus, of the Posts menu. The Wikipedia Tyre menu is a link to the wikipedia page. In this case the Posts menu is a link to # which makes it inactive but allows it to act as the top of a dropdown. After you create a menu a new tab appears, Manage Locations, here you will see a list of places you can add a menu. In the case of our TwentyFourteen theme there are 2, Top Primary & Secondary in Left Sidebar. Here we have added a simple Secondary Menu. This example shows a Classes Menu with the different Classes as Submenu.